Corporate Governance : NEOJAPAN Inc.
NEOJAPAN's managerial philosophy is to "contribute to the formation of an abundant society through real IT communications." Our goal is to provide not only a few advanced companies with the advantages of top-end IT, but all companies. 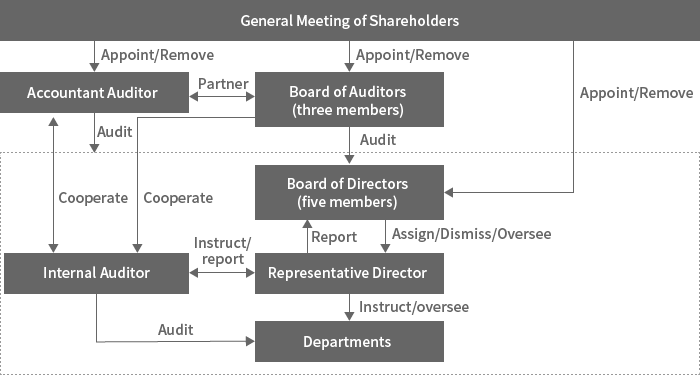 Based on this managerial philosophy, we see building corporate governance as essential to improving corporate value so as to fulfill the expectations and trust of our stakeholders—including NEOJAPAN's shareholders, business partners and employees—and we endeavor to construct the optimal administrative structure to ensure sound, efficient and transparent operations. NEOJAPAN has adopted a board of auditors system. In accordance with the Companies Act of Japan, the company convenes general meetings of shareholders and has set up a Board of Directors and Board of Auditors. The five members of the Board of Directors (of whom one is an outside director) engage in prompt decision-making and NEOJAPAN ensures that the Board plays an active role. Furthermore, NEOJAPAN has configured its Board of Auditors so that all three of its members are from outside the company. This arrangement maintains fair and transparent management that is based on objective, neutral auditing of the company's business affairs. We believe these two bodies create corporate governance with an efficient managerial system and fully functioning business auditing.